For a phone that costs less than £400, the Galaxy A5 is impressive in its design and build. Even its display and performance so far seem to punch beyond that price point. In many ways, it’s a cheaper version of the Galaxy S7, except, it doesn’t really feel cheap at all when you pick it up. It’s solid and beautiful. In a market where small, disruptive companies are releasing phones with flagship specifications at low prices - think OnePlus, Honor and Oppo - it's harder for big companies like Samsung to compete in the traditional model. Samsung knows how to make an all-out flagship, like the excellent Galaxy S7 edge, but can the cut-down Galaxy A5 keep customers happy who want a great experience without all the top-end features? Before the Galaxy S series phones made their switch from flimsy cheap plastic to the more high-end materials we're now used to, Samsung experimented with metal and glass on the mid-range Galaxy A series. An experiment which we're happy to see further improved for the 2017 versions. The Galaxy A5 is easily one of the nicest looking phones around, featuring an all glass front and back with sumptuous curves all over the place. These not only look great and catch reflections, they ensure the phone feels like it should be in your hand, not on your desk or in your pocket. It sits so well in the palm that picking it up almost becomes an addiction. Although it's not as prominent as the back panel, the glass on the front also curves towards the edges. It would appear seamless if the gently rounded metal edges were finished to match the glossy glass. The Galaxy A5 features many of the usual ports and buttons you'd expect to see on a regular smartphone, but not in the same places you'd see them on other brands. One particularly curious placement is that of the loudspeaker: it doesn't sit on the bottom edge, and isn't front-facing, but rather it's been built into the right edge, near the top corner, where most phones might have a volume or power button. The power button actually sits about half an inch below it. That means the bottom edge just features the 3.5mm jack and a Type-C port, while the right edge has a SIM tray and the volume buttons. A microSD card tray lives in the top edge, as does a noise-cancelling mic. As a bonus, it's also IP68 rated water and dust resistant. Perhaps the one negative is the tradition of using capacitive buttons on the front of the phone. While they're easy to use, they're also too easy to catch accidentally. We've lost count of the times we've pressed the back or multitasking button without meaning to, inadvertently cancelling what we're doing or launching the recent apps screen. Sticking with the buttons, the fingerprint sensor also regularly failed to recognise our registered thumbprint, leaving us constantly having to readjust our grip or just give up and use the regular pattern unlock. Unlike its higher-end S-series cousin, the new A5 features a Full HD panel. Because it's 5.2-inches and no bigger, the resolution is ample to deliver a sharp, crisp display. You'll pretty much need a magnifying glass to see individual pixels. As Sunsung has used an AMOLED display the coloursare very vibrant and saturated, while the blacks are super inky, giving lots of life and contrast to all your videos and games. AMOLED also means Samsung can bring across its Always On display to the Galaxy A phones. So now you can have the time and any important notifications or events constantly on display on your lock screen, even in standby, without burning the screen like it would with LCD. Samsung likes to load up its phones with its own flavour of Android, this time built on top of Android Marshmallow. That's a generation behind the current top-end devices, which is perhaps one negative aspect of the device, although bargain-hunters may not mind or notice its lack of Android Nougat. The version of Samsung's software skin in the A5 is much lighter than previous years and, while still not perfect, it's a lot better. All the elements flow smoothly together and there aren't any migraine-inducing bright colours or clashes. The drop-down and settings menus are clean and clutter free with simple text and logos, while the app drawer shows the apps on top of a frosted glass backdrop over the homescreen wallpaper. It also comes loaded with a number of Samsung's own apps like S Voice, which could soon be pushed aside in favour of the rumoured "Bixby" assistant, which is part of the reason Samsung runs its own software skin. There's also the Galaxy Apps store for downloading themes and wallpapers, as well as some exclusive games and offers. There are also the usual suspects: Notes, Calendar, Gallery, Contacts, Clock and Samsung Pay (which isn't yet available in the UK). There's also S Health for tracking all your activity and exercise and the Secure Folder which gives you a fingerprint locked/password protected space to keep private files or documents. Samsung S Health review: Is Samsung's fitness app in the best shape? One of the cool features in the A5 is the wallpapers which react to movement to change colour. By choosing a wallpaper with the appropriate logo icon display, the lock screen wallpaper can change colours based on the angle you're holding the phone. And, of course, there's the long screenshot which allows you to capture an entire page in one go, no matter how long that page is. While it's not quite as high-power as the Exynos 8890 chips found inside the latest Galaxy S range and the Meizu Pro 6 Plus, the Exynos 7880 octa-core chip inside the new A5 provides ample horsepower to get you through your daily tasks. Even heavy mobile gamers should get by with it. Playing most games resulted in mostly smooth, flowing animation, although there was the odd stutter here and there that's not too dissimilar to what we've noticed on most phones on occasion. For the average user who just wants to play Candy Crush every now and then, catch-up with friends on Facebook, browse the web and WhatsApp all day, it's more than powerful enough. It's paired with 3GB RAM to ensure your phone doesn't buckle under heavy load, and has 32GB of storage which is just about the minimum amount of space you'd want in a smartphone these days. If you do worry about running out of space for all your media, you'll be pleased to know there's a microSD slot that supports cards up to 256GB. Keeping all of this running all day is a 3,000mAh battery which, in our testing, was capable of getting through a full day of fairly heavy use without needing to be plugged in. Most days we got through to bedtime with it just having hit the 20 percent "panic level". Samsung has built-in its own battery optimising features into its software. You can switch on a "medium" power saving mode to reduce screen brightness, limit processor speeds and switch off the Always On display. If that's not enough, you can switch on the "maximum" version which limits those features even more. For more granular control you have the ability to choose which apps are allowed to use power and run in the background. Samsung states it also has fast-charging capabilities, except it isn't Qualcomm's industry standard Quick Charge technology. We suspect charging times aren't especially quick, at least not compared to the likes of Oppo's VOOC charging or OnePlus' Dash Charge. Sadly we couldn't test it since our unit didn't come with the official retail power adapter. 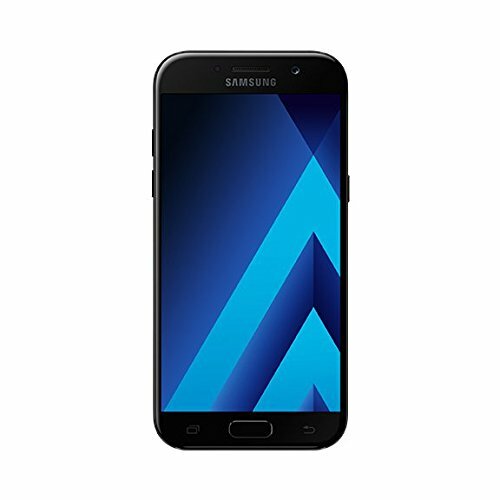 Samsung Galaxy A5 (2017) review: The selfie-snapping champ? As cameras go, the specifications of the A5's snapper certainly looks decent enough. The 16-megapixel sensor is capable of shooting Full HD video, while the f/1.9 aperture helps provide ample light in darker scenes. However the sensor's quality doesn't come to competing with its bigger brother S7. Samsung boasts that the main camera is speedy and accurate, and that you can use instant filters to add a boost to your photos without needing the help of Instagram. It even has a dedicated "food mode" for making your delicious eggs Benedict look even more delicious. Or something. The front camera also has a 16-megapixel sensor with the same f/1.9 aperture lens, and can use the screen as a large flash to evenly light all of your selfies. In real-world use, the camera is capable of taking balance shots in good light with eye-pleasing sharpness and depth. However, it wasn't consistent in automatic mode during our tests. There was a lot of lens flare when taking photos with a bright light source in the frame, or even towards the edge of the frame. And without HDR mode switched on, the camera's image processor had a hard time with high contrast scenes. Still, in most instances, the camera is more than adequate for taking good photos for sharing on social media. And, if the automatic mode isn't good enough, there's a manual "pro" mode which lets you set the exposure, ISO sensitivity and white balance as you please. For a phone that costs less than £400, the Galaxy A5 is impressive in its design and build. Even its display and performance punch beyond that price point. In many ways it's a cheaper version of the Galaxy S7, except it doesn't really feel cheap at all when you pick it up. It's solid and quite beautiful. It may not have the most powerful processor, the most densely packed pixels on the screen, nor tip-top cameras, but it's still a compelling device. Especially at a price that's £30 lower than a OnePlus 3T. It's just a shame it's not running the latest version of Android. Our thanks to Vodafone for the loan of this Galaxy A5 for the purpose of this review. The OnePlus 3T is undoubtedly the king of mid-priced phones. It's built and performs like a true flagship phone, but costs virtually half as much. Its solid metal body is completely different to the Galaxy's obsidian glass finish, and its screen is bigger. What's more, Dash Charge is genuinely quick at refuelling when you're running low on battery. The Honor 8 has share some similarities with the Galaxy A5, none more obvious than the curvy, glossy build and styling. It also happens to share the same screen size and resolution, although it's LCD rather than AMOLED. The software experience is different however, and the dual camera system throws something unique in the mix.